If you are expecting a package but out at the store, don't you wish you could remotely tell the UPS guy to leave it on the front step? Believe it or not, there are Wi-Fi enabled doorbells that let you stream live video of who's at your door and let you chat with them in real time via an app, even when you're not home. The latest version of the DoorBot ($199) launched on Monday to bring you the smartest doorbell on the block. 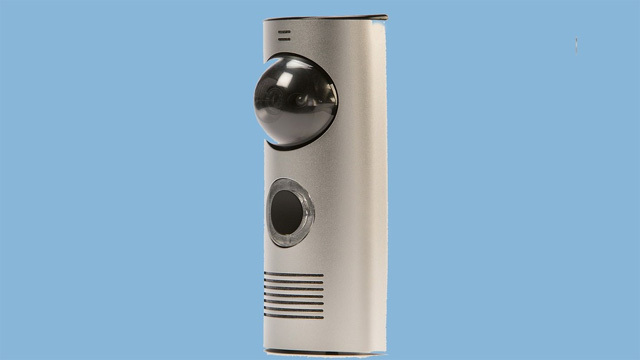 Similar to previous models, it gets mounted outside your front door where your typical doorbell would reside (it attaches to the top of your existing one) and has a camera on the front. When someone rings the bell, the DoorBot calls your smartphone and transmits a live video stream via the built-in Wi-Fi of what it sees. It pops up via the free DoorBot app. The new product comes in a smaller size — 5.68 (h) x 2.39 (w) — with an internal rechargeable lithium polymer battery, which works for about a year. The faceplate is also sleeker and is designed to be stronger, so the device can't be easily stolen. Users can also add a service called Lockitron to the device, which locks and unlocks their front door remotely from their smartphone. This will make the overall price of the DoorBot about $349. What do you think of the DoorBot? Which other home devices do you wish you could operate remotely? Let us know in the comments below. Written by Samantha Murphy. Originally appeared on Mashable.